Inside: A top knot for curly biracial hair is a pretty hairstyle for mixed girls that’s super easy to do! I love bun hairstyles for my daughter, but it’s been hard to find a style where the hair won’t pop out of the bun, or the bun won’t slide down her head throughout the day. I figure if I’m gonna spend time to put her hair in a hairstyle, I want some mileage out of that hairstyle! After lots of experimenting, I finally figured out a way to do a pretty, curly top knot on my daughter’s biracial hair. The way I did this curly top knot is a little different, but I loved it because it stayed up! She ran, bounced, went to school, and slept on it, and all of the hair stayed in the bun! Plus the bun stayed right on top of her head too, no slipping! This is actually the first hairstyle I’ve attempted without doing the detangle process first. I did this style on day 3 hair. 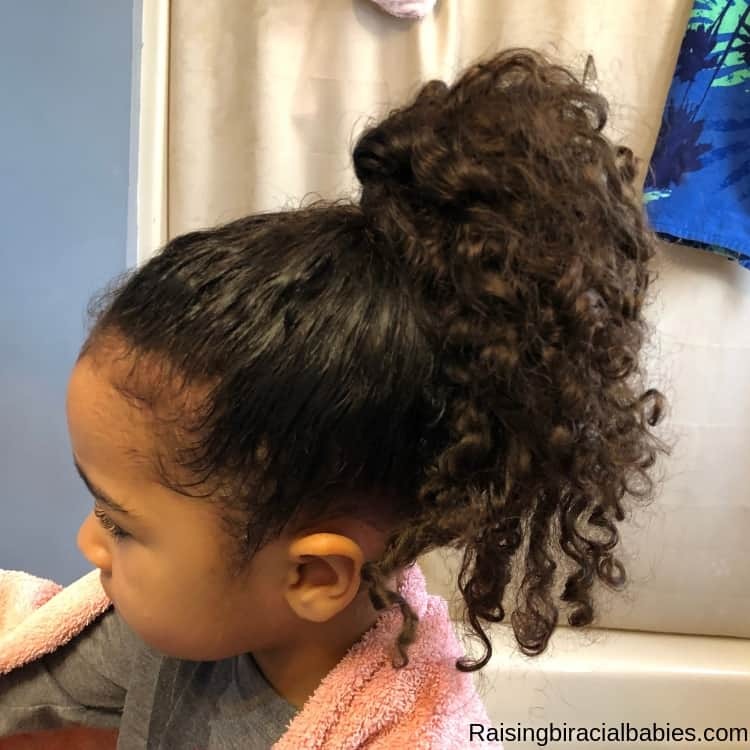 Most mixed kids hairstyles work better when you style their hair right after it’s detangled, so I really like the versatility with this top knot in either using freshly detangled hair or hair that’s not detangled. If you do it after the detangle process, you’ll end up with a sleeker top knot. If you do it when their hair is already dry, you’ll end up with a slightly messier curly top knot, (which I like the look of). You’ll start by spraying their hair so that it’s fairly wet, and apply some leave in conditioning cream. Then gather all the hair up towards the top of their head and hold the hair in place with your hand. Then use a comb, (wide tooth comb works best for this part) and comb the hair up towards the top where you want the top knot to be. (You’re still holding their hair with your other hand at this point). When you’re gently combing in an upwards motion, this is to get any major clumps and frizzy mixed hair to lay down, it’s NOT to detangle their hair! If you try to comb all their hair to lay flat, you’ll surely yank on some tangles, and the result will be yells, tears, or both! Once you’ve got their hair up where you want it, wrap a hair tie around as many times as you can making a ponytail. You want the ponytail to be tight enough that it won’t fall, but not too tight that it’ll give your kid a headache. Make sure whichever hair ties you end up using don’t have the metal piece on them because those can rip and damage hair. These are some good hair ties for curly hair. Now you’ll apply some edge control along the hairline to keep the frizz down. You can apply it with your fingers or with an edge control brush. So I stick with applying some edge control with my fingers, knowing the hair won’t stay sleek for an entire week. But again, I’m ok with that. After putting your edge control in, grab the ponytail and begin twisting it in one direction, (as if you’re twirling the hair). Once you’ve done that a few times you can begin wrapping it around the ponytail holder. This is the part that’s a little different. I know a lot of people use bobby pins to secure buns and top knots, but I can never seem to secure the hair well enough with bobby pins and some of the hair ends up coming out. But with this way of securing the curly top knot, the hair doesn’t come out! When the hair is completely twisted around and you have a top knot, grab a hair tie and wrap it around the bottom of the top knot as many times as you can. Then take another hair tie, and wrap it around the bottom of the top knot. So you’ll have two hair ties securing the top knot in place. Now you have a beautiful top knot for curly biracial hair! The versatility with this mixed girl hairstyle, (either polished and sleek, or voluminous and messy) means you can dress this style up or keep it casual. It’s also a great style to do when you need to go somewhere and you don’t have a lot of time to do your child’s hair. This super easy style for biracial curly hair is definitely gonna be a go-to when we have to run out the door!